"After seeing that work, my faith in humanity and the goddess of fate just fell to an all time low." At first glance, this is kind of like an Aztec themed Tower of Druaga: Aegis of Uruk. Rokka has an overconfident protagonist, a perky love interest who probably knows too much, a cosplaying 12 year old who talks in third person, and a bunch of CG monsters that look like they're from 2007. Yeah… You almost think it’ll be like that until the characters start hurling unfounded accusations around. We’re supposed to stop the dark lord, but let’s do a witch hunt instead. Rokka isn’t really a dungeon crawl. It’s more of a mystery/whodunit type of anime. The goddess of fate chose a bunch of sociopaths with suspicious motives to be her champions and the viewer is supposed to figure out who doesn’t belong when an extra one appears. As expected from a group of maladjusted killers, most of the characters are very eager to kill someone, making it like a game of Mafia only with the threat of actual extrajudicial violence. "You’re not guilty? That’s exactly what a guilty person would say." – Mora the chain smoking 35 year old Gymn teacher. Thus begins our story of suspicion, dysfunctional romance, and betrayal. This is probably a highlight of the summer anime season. It's extremely flawed, but in a very lovable way. If you don't smile at Mr. Crocodile, there is something wrong with you. If you want to know how to take an interesting concept, milk it for all its worth (and then some) while executing it in an utterly horrible manner, look no further than "Rokka - Braves if the Six Flowers". While the main premise (group of chosen heroes set out to save the world from the demon king) is nothing new, the colorful cast and the twist of having an impostor in their midst should be more than enough to keep things fresh and interesting. And it actually is - for the first 4 or 5 episodes. There's some nice world-building going on, some have criticized the CGI monsters but I found them rather usable, the characters and action scenes work quite well and things are moving forward at a decent pace. Then the characters get stuck in a temple and the plot, not to mention the pacing completely disintegrates. After the above event, the show takes an almost 180 degrees turn in terms of tone and approach. From an action fantasy, the anime turns almost into a detective story, with the characters suspecting each other and trying to come up with theories and evidence concerning the identity of the impostor. Not to say that this can't be done well. The sudden genre shift is (incredibly) weird, but we've seen well-made detective stories in animation quite a few times. A medieval "whodunnit" again offers quite a bit of potential, actually. Regrettably, however, very little of it is realized. First of all, the pacing becomes unbearably slow. Looking back at the light novel adaptations of the recent past, I guess the anime producers now think they can get away with anything, but adapting a single light novel into a 12 episode series is still a bad joke. There's simply not enough material to cover, and it shows, so obviously that it's painful. What's even worse, however, is the fact that the show ignores a crucial part of the detective story genre: the audience usually does its own investigation along with the characters. Coming up with your own theories given the information available really is half the fun - or at least it should be. The problem is, most of the information revealed turns out to be largely insignificant, the conclusive evidence being found completely randomly in the last episode. After they've spent 7 episodes on false theories. That's not how you do a detective story, for Pete's sake. Thanks to shows like this, I'm starting to get wary of light novel-based anime; but Rokka not only fails as an adaptation, but actually shows the source material in a rather negative light. Sadly, I can't recommend watching it at all. For those of you who don't know, this is based off of an ongoing light novel (Rokka no Yuusha), that I've recently caught up with. And let me just say, the predictability, design flaws and 2 dimensional characters; are all intentional at this point. I'd stick with it, it'll all make sense eventually. This story is all about the long game that comes with solving a mystery, and ask some questions that are often left unanswered in your usual high fantasy anime. True, its not as refreshing as I'd like, but trust me when I say there is much to look forward to. This is barely the beginning. Great Start! Fantastic Animation and art! This is going to be a great anime, I can tell just from the first episode! Definitely give it a shot. The art is gorgeous and seems to be loosely based on Aztecan/Mayan structures and art. Really I cannot wait to see more from this, it has me hooked. The main character is cocky and likeable and they waste no time diving right into the story. Don't look past this one guys! First thing I thought of when I saw the cover is "Oh look another fan service fighting anime". I was sorely mistaken... the Art style, Story and Character Development has got me hungry for more and more! The amount of work put into the background and textures makes it feel like a movie. The only thing that bugs me is the animated monsters seem out of place in the environment. So far (after 6 episodes) this show has been consistently good, with a lovable (if cliché) main character, cool (if over-the-top) character designs and fighting styles and, most importantly a genuinely engageing intrigue. I honestly have no idea how this will play out. If you're looking for an action fantasy show with a hint of mystery, you could go a lot worse than Rokka. Still I have one nit-pick: The CGI monsters look jarring and awful. Any scene featuring these monstrosities (in a bad way) is ruined for me. CGI works if you're gonna animate cars, maybe robots, maybe maybe landscapes, but please never ever make anything living or organic with it. Please. You can take it from me, light novel adaptations forever remain in the pile of forgettable anime, often exemplifying what bad writing truly is through the abuse of character cliches and predictable plot lines. Indeed, Rokka no Yuusha seemed to adhere to this template, before burying it under a thick sheet of mystery, which not only breaks fresh ground in the fantasy genre but also elevates the quality of the story as a whole. 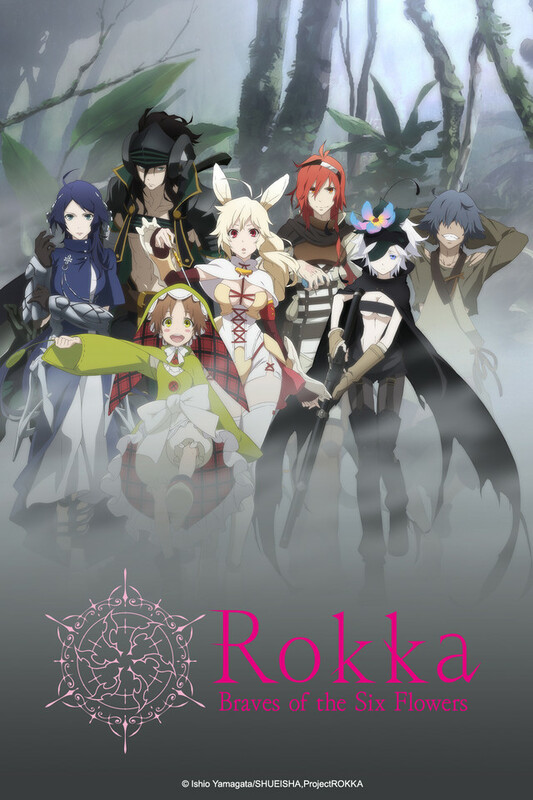 Rokka is about six chosen heroes, called the Braves of the Six Flowers who assemble once every millennium to prevent the revival of the Demon God and remove the threat of evil fiends subservient to it. Sounds familiar, right? Group of heroes, Demon God, fiends, you've heard it all before. But have you heard about the protagonists falling into a trap left by a fake hero where there is in fact seven braves and not six? Of course you haven't. This changes the entire formula by deviating from a generic series revolving around mindless action to a series saturated in mind games and plot twists whilst maintaining an incredible level of tension. If anything, the way in which Rokka is structured is nothing short of impressive down to the smallest of details. Ishio Yamagata -the author- manages to blend unlikely genres together like adventure and mystery which, while both being incongruous, doesn't interfere with the flow of the narrative since by episode 5, the adventure element is subverted for the latter - and thank god for that. The weakest segment in this show is the poor execution of adventure that persisted for a few of the early episodes. Instead of walking and talking on horseback for the sake of exposition, they could have provided more action and animation in order to inject some more personality into the adventure itself; that is, if you wanted a story of pure adventure. Retrospectively, this shouldn't be deemed as a flaw in the story; rather, a nitpick. Many people misunderstand that these first few episodes serve as a setup to the upcoming mystery of the imposter by instilling a more lackadaisical, relaxing atmosphere compared to other adventure/action series which can be seen through the importance given to character interactions and dialogue that make up most of the episodes. This, in turn, cranks up the tension, with each episode making you feel more uneasy as more mystery elements enter the mix and relationships start to go awry. Episode 5 is the climax of this, as it is clear that the anime has transformed into a full-blown locked room mystery and so the heroes start pointing fingers. What contributes to all of these aspects is the slow-pacing, an essential feature in making a good mystery. Studio Passione made the correct decision to do so because if they had done otherwise, the end result would have been the usual rushed train wreck of a LN adaptation that we get every anime season. Metaphorically speaking, Rokka is a slow-burning barbecue that engages you by cooking up ideas in your mind through extended dialogue and character development. It only works because you are given time to absorb the information, allowing you to speculate while immersing you into the atmosphere. Rokka has a small but diverse group of characters that are bursting with the potential for depth. As I have read the light novels, I can guarantee this, though only a few of the characters in this season are rewarded with the development they deserve, namely the first three who are introduced: Adlet, Nashetania and Fremy. The others, in spite of being subtly built up, won't be thoroughly explored until a possible second season. Besides that, all of Rokka's cast are not limited to archetypes or cliches, each and every one of them bringing something new to the table. Adlet, our MC, though quasi-generic in the first few episodes with his strong beliefs in protecting friends, is given superb characterization as a mentally-troubled individual. Hence the surface-level cocky attitude and 'strongest man in the world' shtick in order to block out his fears and past trauma. As much as I would love to shower this series with more praise than I already have, there are just some areas that are irreversibly bad. Most notably, is the production, which remains largely inconsistent throughout the series. For one or two episodes the animation is of a high quality only to be reduced next episode to choppy fight scenes, jarring CGI and disproportionate face drawings . The art, however, when at its pinnacle performance, looks stunning as the characters and backgrounds are encased in the Mesoamerican zeitgeist. There are two redeeming factors for Rokka's poor animation, these being the directing and the music. Takahashi Takeo (Spice and Wolf) was brought on board the Passione staff because of his ability to enrich the dialogue and action sequences with amazing shot composition and camera movements while the talented Oshima Michiru (Fullmetal Alchemist, The Tatami Galaxy, Snow White with the Red Hair, Blast of Tempest) composed the OST for Rokka further enhancing the suspense and overall atmosphere. To be frank, I am quite disappointed that many people can't appreciate a mystery series like this and instead criticize the show for its inherent slow-pacing. There are haystacks full of shows that can give you the quick fix of rushed storytelling with brainless amounts of action and cookie cutter characters (Gate for this season?) but Rokka no Yuusha is your needle in these haystacks. It manages to stay fundamentally and externally original while still maintaining a strong thematic backbone consisting of: the blur between good and evil, "what does it mean to be strong? ", "what is a Brave? ", trust and betrayal etc. True enough, such themes reek of overuse, but this series is so nuanced that the portrayal of said themes come out fresh. I highly recommend this series to any one, but only once it has ended its first season (Mid-September 2015) because the experience is much better when you don't have to suffer waiting weeks for another episode to air. Even if your an action fanatic, you will be pleasantly surprised by what you have witnessed; the best among what the year 2015 of anime has to offer. A heroes' journey turned into a bad mystery. Where better told stories give the audience enough evidence sprinkled among the red herrings to unravel the plot themselves, Rokka's conclusion is pulled from thin air in the final episode. Few members of the main cast go through any sort of development. The rest are there to delay the plot for 8 episodes by acting nonsensically. With the promise that the main plot device will be recycled wholesale for the next season, I see little reason to continue watching. I would say that this first ep was great! Our main character Adlet Mayer, is a cocky fellow claiming that he is the strongest in the world which we will have to see and wait, yet i really like his optimism he's the kinda guy who would smile at the face of defeat anyways the animation and art are on point and the sound and music are also superb. The setting has some inspired aztec architectures, I've been anticipating this show for a while and im glad we finally got our first episode. I also would like to check out the light novel of this series, but there isn't a official english translation yet so hopefully it get licensed.. If you liked the first 4 episodes stop watching this. The show is an utter bait and switch that quickly turns into a locked room genre snooze fest of backstory and "who did it" "you did it" "he did it" "she did it. TWIST!" Long story short this is not an anime about people with amazing fighting abilities chosen by god to save the world. It's a game of Clue livestreamed. I have it a 2/5 just because I like bunny girls.